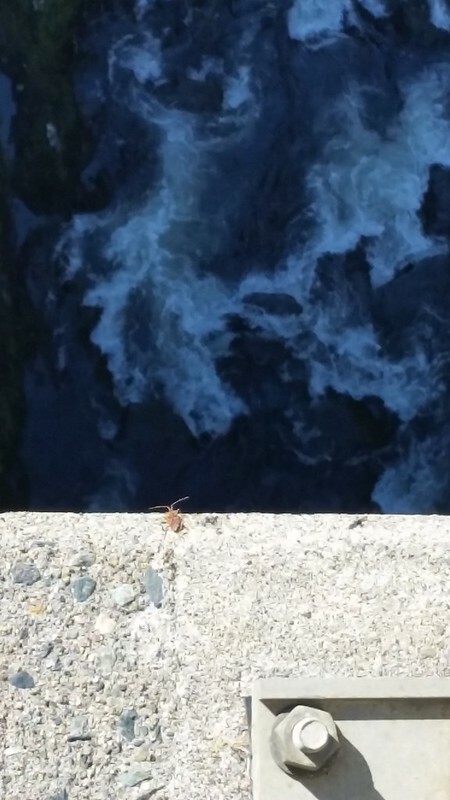 A bug on a bridge looking over into a gorge and the water below. I was amused by this moment, while standing on a bridge and looking down to see another creature, largely performing the same feat. I doubt he was marveling at the distance below or thinking about the reasons why people build bridges and then people come to stand on said bridges to look down, but he was there with me and the other tourists pondering the deep ravine. In some ways, this picture reminds me of the scene in so many sci-fi movies where the characters stand on some spaceship's deck looking down upon the Earth. The white and gray granite feels other-wordly and so distant from the dark blues of the water below. And here are the bug and me just gazing contemplatively into the dark blue abyss.